January is a great time to evaluate, set goals and make plans for the new year. Ahhh.. to dream the impossible dream. Have you considered creating some goals to get your documentary made in 2012? Are you stuck and in need of funding? Create a fundraising packet, proposal and budget. Launch a crowdfunding campaign! Got hundreds of hours of footage and lost in a sea of interviews and b-roll? Write a script or start experimenting with mini-scenes. Got a finished film? (congratulations!) Find a distributor or create your own DIY distribution strategy. Wherever you are in the process, write down your goals and commit to them. What do you think? Can you finish your documentary in 2012? Imagine that you have completed your film. How does that make you feel? Are you glad you did it? What would it take for you to make it to the finish line? Is there anything you could do right now, today, that would move your project forward? Do you need help with your documentary? Fill out our 1-minute survey and tell us about your project. It's mind boggling all the details involved in making a film and that's why we started Desktop Documentaries. To help you make your film. It's easier and cheaper than ever to make a documentary. That doesn't mean it's EASY... just easier. If you wanted to, you could shoot your entire documentary on your cell phone! I'm not necessarily suggesting you do that, just saying ;)... Great storytelling is great storytelling whether it's shot on a cell phone or a $100,000 pro camera. My biggest advice is to use what you can afford and move forward! Don't wait to have everything perfectly in place..
What are YOUR 2012 New Years Resolutions to get your documentary made? Reply to this e-mail and let me know. I'm going to combine all the responses into my next article as inspiration to other filmmakers. Is your goal big (finish your film) or small (shoot five interviews this year). Whatever your goals are for your documentary and for your life, I wish you much success and happiness in 2012! Best Documentaries of 2011 and Beyond - Can you name the best documentaries of 2011 or of all time? Check out this fun list of the best docs and create YOUR OWN top 10 list of best documentaries. Filming Sports | How To Capture The Extreme Shots -- Shooting extreme action shots often requires a high amount of creativity, courage and specialty gear. Check out this really cool video by filmmaker Sebastien Montaz-Rosset and learn how he did it. Confessions of a Filmmaking Amateur | My First Documentary -- Newbie filmmaker Scott Umstattd updates us on his fears, doubts and why he's moving forward anyway. Home Made Videos | Gift Ideas - Even though the holidays are over, there's always someone with a birthday or special occasion that may call for a unique gift. Here are some great gift ideas you can make with your video camera. 2012 Vimeo Film Festival + Awards -- If you love Vimeo as much as I do, you'll want to check out their upcoming film festival and awards. Deadline to submit your film is February 20. Documentary Idea: What Makes You Happy - Check out one of the latest documentary ideas that came in from Joe Metzger. Leave comments and pitch your own ideas! 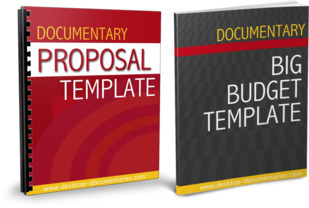 If you need money for your documentary, you're going to need a proposal and budget. We've put together a robust packet of templates to get you started. If you're staring at a blank page and wondering where to start, this bundle is a life saver. This packet is being offered at a special discount with prices going up in 2012, so if you think you might need these, now is the time to grab them!